Want to get your boat on our cover? Cover shots are vertical (portrait, not landscape) in their orientation. We need some breathing space at the top and bottom for the nameplate and that annoying little barcode box. Cover shots are high-resolution. The final image at 300 dpi must be 9 x 12. That means at least 2700 x 3600 pixels. Cover images should not be manipulated by the photographer. We want your original shot because we'll do additional manipulation and don't want to wind up with unexpected results. Some action shots are made when a sailboat is racing. But if it is obviously racing (think of crewmembers hanging over the high side), we're not interested. Steer away from racing shots. Steer away from shots of gorgeous wooden boats. Woodies on our cover confuse people. 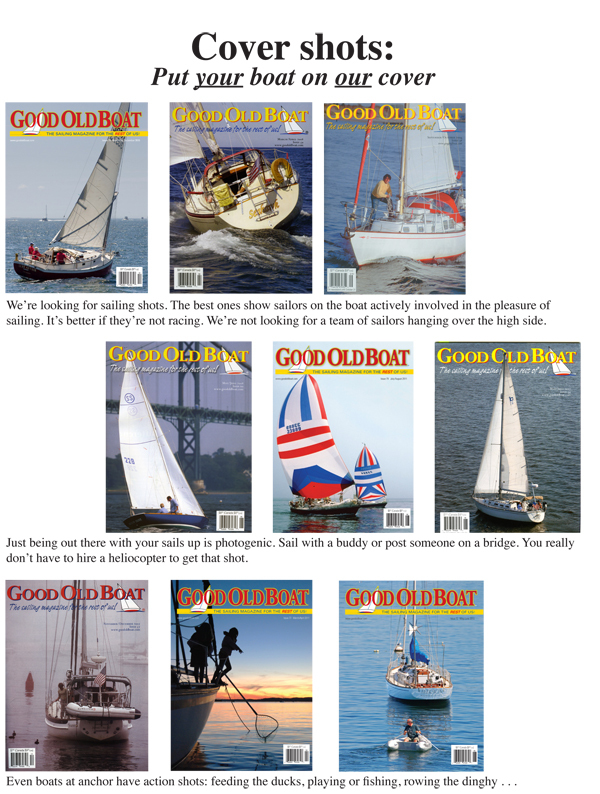 We're about good old fiberglass sailboats and the sailors who sail them, and that's what belongs on our cover. Did we mention that - in addition to all the fame and glory that comes with having your boat on the cover - you get a monetary reward as well? We pay $100 for our cover images. So go out this summer and have a great time. Keep this reminder near your camera. Don't be afraid to surprise and delight us. All cover images will be cheerfully received and considered! Send your images in jpg format to karen@goodoldboat.com.